The Supreme Court heard oral argument in two cases on Tuesday. I’m predicting the winners of the Supreme Court cases based on the number of questions asked during oral argument. For more about this method and all of my predictions this Term, click here. 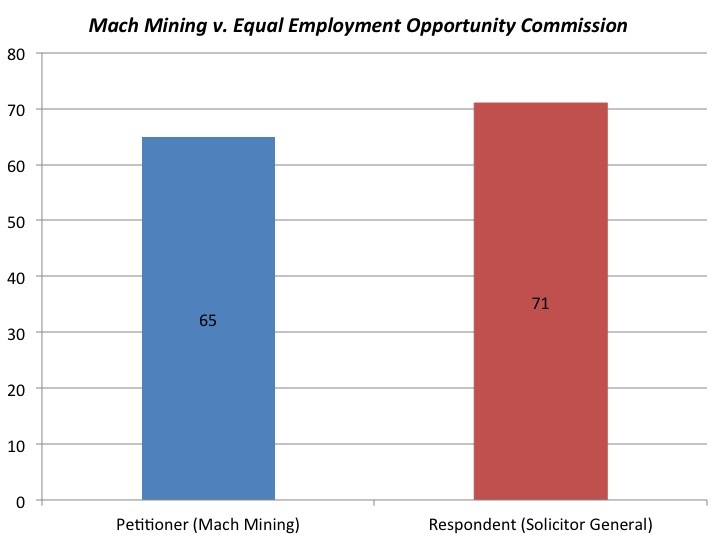 Mach Mining v. Equal Employment Opportunity Commission asks whether and to what extent a court may enforce the Equal Employment Opportunity Commission’s mandatory duty to conciliate discrimination claims before filing suit. I predict a win for the Petitioner (Mach Mining) based on the overall lower question count. The Justices asked the Petitioner 6 fewer questions as shown in Figure 1. But this is a very close call—with probably a split among Justices along ideological lines. Four liberal Justices asked the Petitioner more questions, which suggests they are leaning to the EEOC’s position: Justices Ginsburg (+13), Breyer (+3), Sotomayor (+2), and Kagan (+3). Justice Kennedy also asked the Petitioner more questions (+2), which also suggests he may join the liberal Justices on the side of the EEOC—running counter to my prediction. However, the differential in questions is small and he’s been less predictable from the question counts. Two conservative Justices asked the Respondent more questions: Chief Justice Roberts (+24) and Justice Scalia (+5). Justices Alito and Thomas asked no questions. It’s a close call, but I’ll stick with the side with the lower total question count: the Petitioner (Mach Mining), who argued for the reversal of the Seventh Circuit’s decision rejecting review of the EEOC’s conciliation efforts as a part of a defendant’s affirmative defense in a discrimination lawsuit. The second case, Kellogg Brown & Root Services, Inc. v. United States ex rel. Carter, asks (1) whether the Wartime Suspension of Limitations Act – a criminal code provision that tolls the statute of limitations for “any offense” involving fraud against the government “[w]hen the United States is at war,” 18 U.S.C. § 3287, and which this Court has instructed must be “narrowly construed” in favor of repose – applies to claims of civil fraud brought by private relators, and is triggered without a formal declaration of war, in a manner that leads to indefinite tolling; and (2) whether, contrary to the conclusion of numerous courts, the False Claims Act’s so-called “first-to-file” bar, 31 U.S.C. § 3730(b)(5) – which creates a race to the courthouse to reward relators who promptly disclose fraud against the government, while prohibiting repetitive, parasitic claims – functions as a “one case- at-a-time” rule allowing an infinite series of duplicative claims so long as no prior claim is pending at the time of filing. As the twin questions presented suggest, the legal issues surrounding this qui tam litigation under the False Claims Act, plus the possible tolling of the statute of limitations provided by the Wartime Suspension Limitations Act, are pretty arcane. 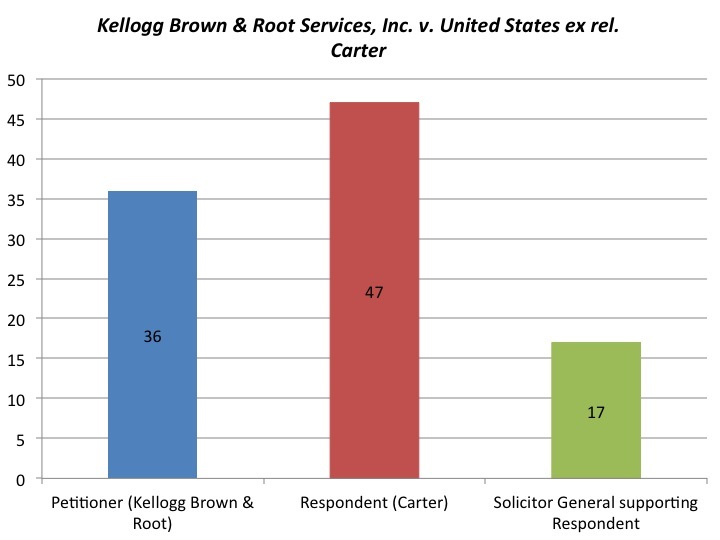 Despite the complexity of the legal issues, I predict a victory for the Petitioner (Kellogg Brown). As shown in Figure 2, the Court asked the Respondent 11 more questions in 20 minutes than it asked the Petitioner in 30 minutes. When considering the Court’s questions to the Solicitor General, who supported the Respondent’s position, the Court asked 28 more questions to the Respondent’s side. The question disparity suggests a win for the Petitioner and a reversal of the Fourth Circuit’s decision.